I had been curious about JTAG ever since I started experimenting with Didj. I had wondered about whether it could be used to investigate our Pollux-based devices. Upon learning that that the ftdi2232 chip could be used to bitbang a JTAG connection and that the same part powers many USB-based JTAG cables, I purchased a $30 breakout board that was based on that chip - DLP Design DLP-USB1232H (datasheet). What follows are the steps I used to make this breakout work with Didj, LX, LPX, and the Pollux-based eGo netbooks. The table below illustrates how to connect the DLP-USB1232H device pins to Didj, LX and the eGo. 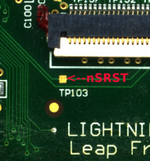 The pinout on the breakout is in the DLP-USB1232H datasheet (pinout is on page 4 and page 7). IMPORTANT: You also need to connect pins 8 and 9 together on the DLP-USB1232H module in order to configure it to be powered via USB. As an alternative to TP103, either side of R43 (jumper/0 Ohms) or the right pad of R45 (unpopulated) works. This is near the other test pads. Also, the Didj or LX must be powered on. To debug bootloaders with GDB, see Didj JTAG How To. The DLP-USB1232H is available from various sources, e.g. : Digikey, Mouser, or Saelig. The module can also be used as a cheap and simple SPI BIOS chip programmer together with the flashrom utility. This page was last edited on 27 October 2011, at 03:11.